My Hair is fine, limp and I've got lots of it... just not on the hairline. The trouble with darker fine hair and a lighter scalp is that the contrast makes it almost impossible to hide a sparse or thinning hairline with hair products and/or extensions. No matter what volumizer you rub in, the scalp always shines through and reveals itself in the worst way. Extensions don't seem to help in the hairline department either and require a lot of teasing and hassle, not to mention a professional hand. Once I realized the dilemma, I simply decided to steer away from slicked-back hairstyles. I hated my hairline and was embarrassed about it. Then, one fine day, I came across a "new" trend that stopped me in my tracks. Apparently, this technique of hairline filling has been around for ages and was hugely popular amongst the Kardashians and JLo's of the world (no wonder their hairlines are always on fleek). I tried it immediately and have been a fan ever since. 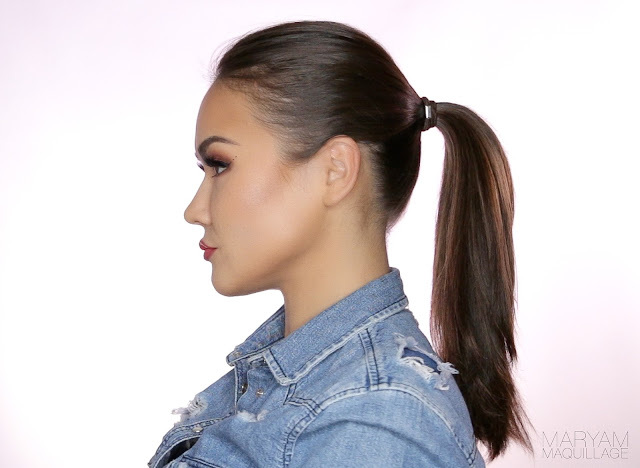 This trick has given me the confidence to wear my hair in a slicked back high ponytail that has become my "go-to" and now I can't stop showing off my forehead! Once I got my hairline covered (pun intended), the only thing left was to match my newly thick hairline to an equally full ponytail. Turns out there's a trick for that as well, and best part is that the whole thing takes under five minutes. All you need is a brush, a comb with a tail, two elastics and a matte eyeshadow that matches your hair color (I explain more in the video). So... are you ready? Watch below & remember to subscribe! Share the love, tell your mama, tell your sister and your friend! This Hair HACK is too good to keep to yourself! I love you guys and I hope you enjoyed!